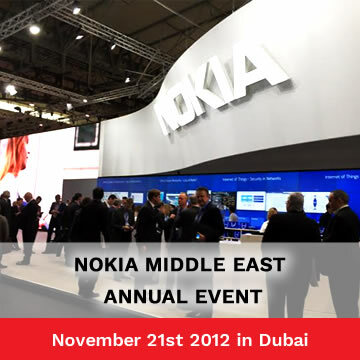 Trinetra Wireless, a leading provider of GPS Vehicle Tracking & Fleet Management Solutions is taking pride about being invited as a partner to exhibit it’s award-winning product offerings, industry specific solution offerings at Nokia Middle East Annual Event scheduled on November 21st 2012 in Dubai. This prestigious recognition has come in the wake of Trinetra’s committed focus in serving Middle Eastern audience. This is a high end, one-day event set to address the topics of particular relevance to Nokia’s Location & Commerce. This annual conference leads the way in the world of navigation and location. Further this platform is meant to bring key industry players in a cross-section of Location Based industries together and provide them a unique opportunity to showcase their product or service to a large professional audience. Trinetra is all set to participate in this show and provide visitors with first hand – real – live – information regarding the products and industry based solution offerings. We at Trinetra strongly believe being part of this Annual Location & Commerce event of Nokia will provide an effective opportunity to technically advance to the next level. Our main focus is to address all the pertinent issues of the sector with innovative GPS Vehicle Tracking & Fleet Management solutions that help clients to overcome the challenges of running the business in a more efficient, more profitable and cost-effective manner. If you’re in the area, don’t miss this opportunity stop by and be sure to meet us at the event and get an idea on how implementation of our product to your vehicles can enhance your business. At Trinetra, we value every opportunity to meet with our clients and exchange ideas & information to foster new business relationship. Trinetra is looking forward to your presence at the event.